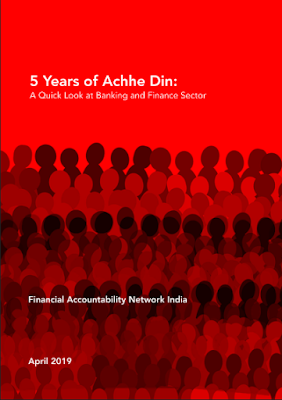 Well-known Delhi-based advocacy group, Financial Accountability Network India, in a just-released compendium during the on-going general elections, “5 Years of Achhe Din: A Quick Look at Banking and Finance Sector”, has sought to analyze on different aspects of finance, banking and the economy. 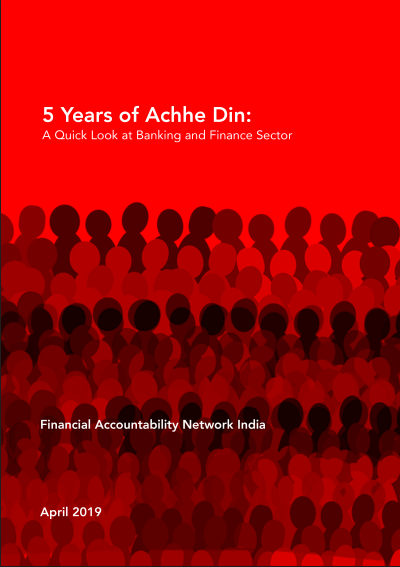 Prepared by well-known experts, including Dinesh Abrol, Rohit Azad, and Sucheta Dalal, the analysis is claimed to have been carried for triggering an “informed discussion” on the economic performance of the NDA-II government. One of the chapters in the 29-page booklet is a critique of how India recently increased its ranking in Ease of Doing Business (EODB). The index rose from 142 in 2014 to 77 in 2018. This was claimed to be a success, and seen as an improved business environment and increased investment in the country, contributing to over-all development. This was also an index to measure how easy it is to conduct private business in the country. EODB straightjackets reforms into a uniform prescription across countries, without looking at regional and country specific issues and gives a ‘one size fit all’ idea. EODB according to World Bank’s own legal unit has a bias towards deregulation and considers regulations are bad for business. It ignores the positive side of regulations on labour, environment, land etc. Labour unions and environmental groups have critisized the report for its bias for deregulation of labour laws and environmental laws. Paul Romer, the chief economist of the World Bank, resigned after raising issues of political bias of these ranking in the context of Chile. The ranking fell when socialist government came into power which contributed to the fall of the government in the next election. India was earlier challenging the EODB ranking as data was collected from only one city, i.e. Mumbai, to determine the ease of doing business of the entire country. This resulted in the formation of an Independent committee on EODB. The committee suggested doing away with the ranking and also renaming the report to understanding regulations as business climate is not being dealt here in the report. India, to attain a higher ranking has made about 10,000 both small and big, as reported by the Prime Minister. These include the most regressive reforms including moving towards a self-regulation and self- certification mode in many inspections earlier done by labour and fire departments. Immediate fallout could be seen in terms of rising incidents of fire in factories and restaurants resulting in deaths due to non-compliance. The EODB change involves labour sector reforms. The reform will see the repealing of 38 of the existing labour laws, and replace them with four new labour codes. These are the Industrial Relations Code (replacing three labour laws), the Code on Wages (replacing four labour laws), the Code on Social Security (replacing 15 laws) and the Code on Occupational Safety and Health and Working conditions (replacing 16 laws). The attempt is to make the laws employer friendly and easier for business and corporates to hire and fire workers. These reforms will also bring make trade unions and collective bargaining harder and will leave smaller enterprises with less than 300 workers outside the control of most labour laws. India is trying to bring a new industrial policy which is business friendly but is not successful yet as there are major disagreements on the contours of the policy. Land, labour and environmental policies are the major impediments for a business friendly country. After the labour laws, much of the environmental clearances and laws are being diluted / by passed for business. The Centre has exempted industries like steel, cement and metal from mandatory prior environment clearance for setting up a new or expanding the existing captive power plant employing waste heat recovery boilers (WHRB) without using any auxiliary fuel. Environment ministry gave up its power to grant environmental clearances for mega-construction projects like malls, offices, residential apartments, and gave it to local municipal bodies — institutions with no scientific expertise or resources to carry out prior assessment of the adverse environmental impact likely to be caused by large projects. Various ‘reforms’ on ease of construction index led to watering down of regulations such as Environment Impact Assessment (EIA) for construction. Earlier, large-scale construction projects with a built up area of 20,000 square metres and above needed permission from two state-level expert committees: the State Expert Appraisal Committee and State Environment Impact Assessment Authority (both committees were setup by the environment ministry). Small-scale projects did not require such elaborate clearances from the environment ministry. Under the new regime, builders could get both the building plan approvals and environment clearances for their large-scale construction projects approved from their respective local municipal corporations, which were expected to set up their own environmental cells. This was later stuck down by the National Green Tribunal. The Ministry of Environment, Forest and Climate change has also brought a new draft Coastal Regulation zone notification, which weakened the existing regulations and opened the coast lines for real estate, ports, and tourism. Regional empowered committees at sub national level have been delegated higher powers to dispose of proposals for Forest Clearance involving diversion of 5 to 40 hectares of forest land and all proposals involving diversion of forestland for linear projects irrespective of area of forest land involved. India’s apex National Board for Wildlife (NBWL), charged with allowing forest land in Protected Areas to be diverted for industry, cleared 682 of the 687 projects (99.82%) that came up for scrutiny. The Forest Advisory Committee (FAC) of the Union environment ministry has granted preliminary forest clearance to the Parsa opencast coal mine, in one of the largest contiguous stretches of very dense forest in central India called Hasdeo Arand that spans 170,000 ha (hectares). Of this, 841.538 ha of biodiversity-rich forest land, about the size of 800 football fields, has been cleared for mining to be operated by Adani. Meanwhile, India has reduced its corporate tax from 30% to 25% and put emphasis on indirect taxes through a GST regime. The insolvency code and associated reforms are part of EODB ease of doing business as it helps the ease at which one can start business and exit business. The insolvency regimes help business to move one once the business goes bad.